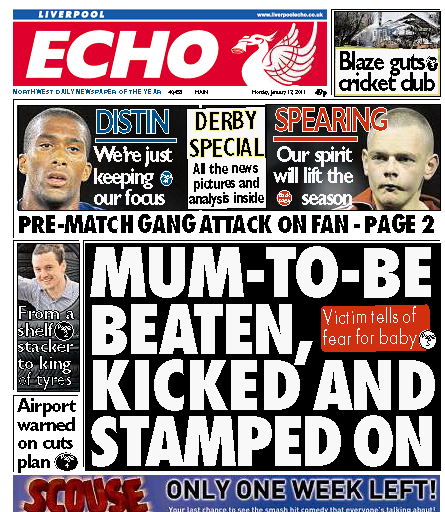 I was working as editor on the Post and the Echo newspapers on the day of the Liverpool FC v Everton FC derby match, when there was an announcement during the match that Anfield Road was closed because of ‘an incident’, and people should avoid that area when the left. Soon after the rumours started: A man was stabbed…a man was dead… an Everton fan had been stabbed by a Liverpool fan… two Everton fans had been stabbed… one Everton fan was dead, another fighting for life..you get the picture*. I was tracking the story across Twitter and Facebook, and I couldn’t believe what some people were posting – without a shred of evidence that anyone was stabbed, let alone dead. Interestingly, we were tweeting the official police confirmation that a man had been assaulted at the King Harry pub, but the noise of the networks swept the grains of truth away without regard. I also found a Mirror journalist at the game had asked a policeman, who was refreshingly off-message, but still rumours flew back and forth. ‘Everton fan stabbed to death’ tweets were still being posted after 11pm and no doubt they will continue tomorrow.